His focus remains on Rangers but Steven Gerrard says he is starting to feel the pressure of Liverpool’s title bid. Gerrard celebrates scoring during the Legends match at Anfield against AC Milan. 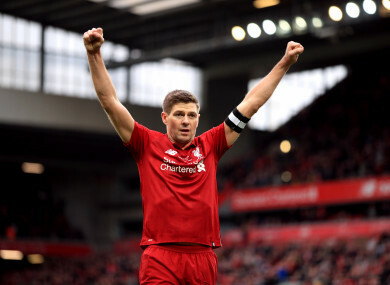 STEVEN GERRARD SAYS he would be “the happiest man in the world” if Liverpool won the Premier League this season. Gerrard is considered one of the club’s greatest ever players, scoring 186 goals in in 710 appearances before joining LA Galaxy in 2015. Jurgen Klopp’s side are two points ahead of Manchester City at the Premier League summit, but Pep Guardiola’s men have a game in hand. Gerrard is now manager of Scottish side Rangers but he admits that he still pays close attention to his former club’s fortunes and desperately wants them to claim a first top-flight title since 1990. “Believe me, I’m still feeling the pressure!” he told Liverpool’s official website. “It’s always a special time to come to Anfield, especially when it’s full, and just put the kit on,” he added. “To play against Milan with all my former team-mates, and to get the winner, is obviously a special feeling. Email “Liverpool title win would make me the happiest man in the world, says Gerrard”. Feedback on “Liverpool title win would make me the happiest man in the world, says Gerrard”.